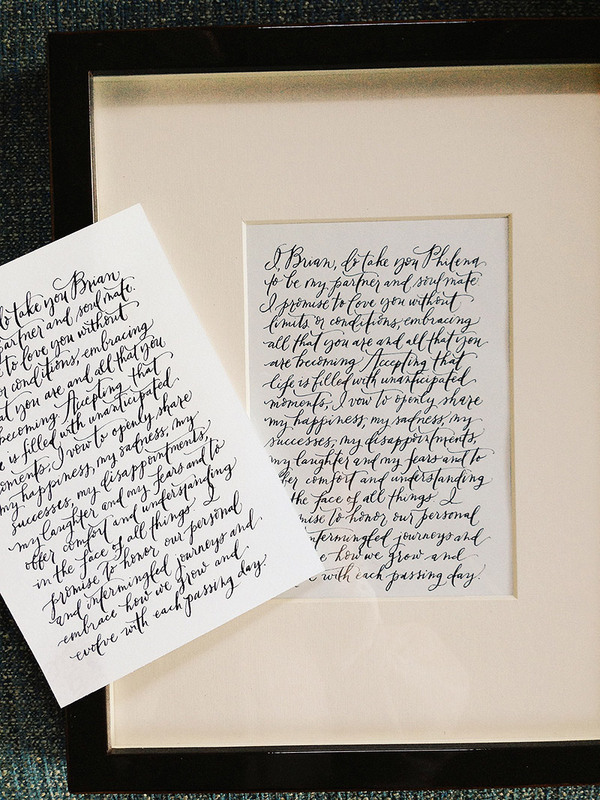 One of my favorite clients, Philena, came back to me asking if I would handletter her and her husband’s wedding vows. She wanted to give them as Christmas gifts. I was more than happy to oblige! This is my first time lettering vows and I do love how it turned out. Philena wanted to keep the size small and the lettering natural to preserve the intimacy. I used 100% cotton Crane paper cropped 5×7. Before putting nib to paper, I simulated the text in Photoshop to give an idea of how small or big I needed to letter, and where the line breaks would go so all the words would fit nicely onto the page. I printed out the digital vows, and overlaid it with a blank piece of paper. I lettered the vows with a pencil and a lightbox, using the digital version underneath as my line and spacing guide. Any mistakes could be easily corrected. Then, I took the final 5×7 piece of paper and lettered the real thing over the penciled version. It took a full day to prep before I even dipped my nib into the ink well, but once that happened I was able to do it confidently and without the shakes, knowing that everything has been laid out perfectly and that I would make no spelling errors. Because it just takes one little mistake for you to start all over again! That is such a thoughtful gift and beautifully done. Thank you for sharing your technique.